A light and tasteful muffin, moist and tender, bursting with blueberries and perfectly golden brown top. Preheat the oven to 1800 and line 12 muffin pan with paper casesPreheat the oven to 1800 and line 12 muffin pan with paper casesSeparate the eggs: Place the egg yolks into a large bowl and place the egg whites in a bowl of an electric mixer.Beat egg whites and 2 ½ Tablespoons of the sugar, using a whisk attachment, on medium- high speed until stiff peaks form. Set aside.In a separate bowl, beat the egg yolks with the remaining sugar, water, and vanilla extract for about 1 minute.Sift the almond flour, tapioca starch and salt over the egg yolk mixture.Then, fold in the whipped egg whites.Fold in ¾ cup of the blueberries. Scoop the batter into the 12 paper cases. 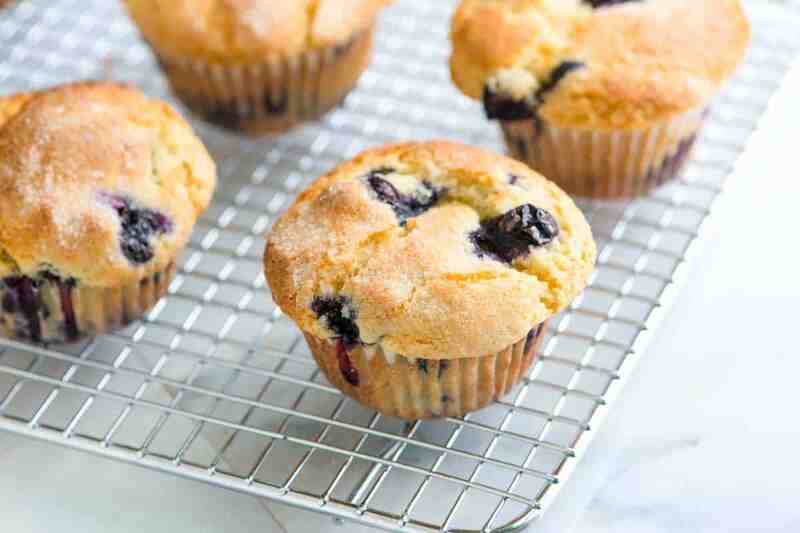 Top each muffin with a few blueberries, using the remaining ¼ cup of blueberries.Bake for 15-19 minutes in the middle of the oven.Allow to cool for 1 hour before eating. These muffins are best when eaten the day baked but they can be stored in a ziploc or in an air tight container in the fridge for 4-5 days.